AEW provided both design engineering and construction observation services to help with functionality, aesthetics and safety for the city’s new Downtown Crossing Improvements project. This project included the modernization of crosswalks and ADA ramps in the downtown area, as well as the addition of several welcoming amenities such as planter boxes, modern bike racks, pedestrian benches, decorative trash receptacles and additional landscaping. Replacement of the dilapidated brick paver crosswalks at the Market and Main Street intersection was a key improvement in this project. 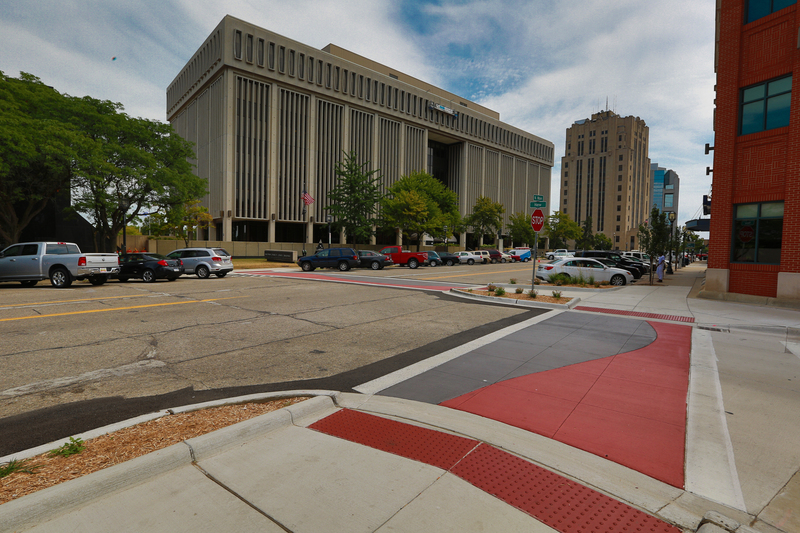 The charcoal and red colored concrete paths were constructed in a meandering pattern to mimic the flow of the Clinton River which flows through the heart of Downtown Mount Clemens. This improvement eliminated multiple trip hazards and gave the Downtown area a refreshed aesthetic. This project also included 0.42 miles of hot mix asphalt (HMA) resurfacing on Market Street between North Avenue and northbound Gratiot. Largely funded with a Transportation Alternatives Program (TAP) Grant, the project was finished both beautifully and on time.